Reminiscent of clunky C64 graphic adventures from the 1980's, without any of the nostalgia. Regular readers of my site will know that I almost never say "This is a bad game; don't play it." I'm as picky and opinionated as the next critic, but I also really love computer games. I finished "In Search Of The Most Amazing Thing" in 1979, and I finished Daggerfall in 1997. I can find something to like in almost any game. But this is a bad game. Don't play it. The only things Riddle of the Sphinx really has going for it are that it makes very nice use of hieroglyphs and is slightly educational (if you're discerning enough to separate the historical facts from the magic parts). If you're very interested in it I'd recommend its sequel The Omega Stone instead, which revisits Egypt as well as several other archaeological ruins but has an improved interface, better plot, and more professional production. As far as computer games for Egyptophilic kids go, Egypt: Tomb of the Pharoah and Mystery of the Mummy got better reviews from my kids and were less annoying to me as the adult navigator. But if you're just looking for a fun adventure game to play and heard good things about "Riddle of the Sphinx," then do yourself a favor: go to my main Adventure Game Reviews site and pick anything, anything else at all off the list. Because computer adventure games have come a long way in the last 20 years, and playing this clunky throwback just because you didn't realize there was anything better available would be a travesty indeed. Style: Riddle of the Sphinx is a simple puzzle adventure game with a 3D first-person view of the environment and an rudimentary point-and-click interface. The plot, such as there is, is a supernatural mystery. Combat and leveling are not elements but there are a few timed puzzles and it is possible to die in this game. Series: Riddle of the Sphinx has had one sequel, The Omega Stone. The two do have a plot connection, but the plot of "Riddle of the Sphinx" is accurately summarized in about twenty seconds at the beginning of "Omega Stone," so you really have nothing to lose by skipping it completely. Finding Riddle of the Sphinx: Inexplicably, this game seems to be relatively popular. You can find it in bargain bins in large computer retail stores, often bundled with its sequel, or buy it online for PC or Mac. 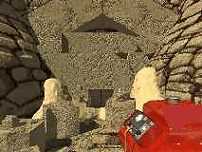 Getting Riddle of the Sphinx to Work: I experienced a lot of lock-ups playing this game (baffling when compared against much more graphically-intense contemporaries like Syberia or Myst: Exile, which never choked once). There is a game patch and troubleshooting FAQ available at the official game site. Save often as you play. Hints For Riddle of the Sphinx: I have a page of Riddle of the Sphinx hints up online, with general gameplay suggestions and a low-spoiler walkthrough that includes no puzzle solutions. If you're looking for a puzzle spoiler, there is a really good hints page at UHS which reveals only one solution at a time, so you won't accidentally learn the answers to future puzzles while scanning for the one you're stuck on. Pitfalls In Riddle of the Sphinx: There are no subtitles and several puzzles require audio to solve; Riddle of the Sphinx is not a game for those with hearing problems, bad speakers, or noisy children in the house. There are a few timed elements, but you can try them as many times as you need to with no ill effects. Game Length: 30 hours, about standard for a puzzle adventure, but the majority of that was taken up in navigation and mindless repetitions of the same task; there were fewer puzzles in Riddle of the Sphinx than in other games its size. Plot and Quests: The plot of this game doesn't actually introduce itself until shortly before the game ends. Up till then the true purpose of playing this game is unknown; an archaeologist friend asked you to explore the pyramid, basically, so you do. It's rarely clear what you're looking for next or what you're supposed to be trying to accomplish. The vague suggestion that this friend may have been a victim of foul play or a curse from the gods turns out to be a red herring, so actually, there really is no point to any of it until the endgame arrives. Puzzles and Mental Challenges: Mostly math and spatial puzzles, with a few inventory puzzles tossed in. Some of the former are tricky, others just require addition skills and some patience. The inventory puzzles are uniformly bad. There's a peculiar design flaw in this game: solving the most complicated, time-consuming puzzles in the game only informs you which of two artifacts to take or which of six buttons to push, meaning players willing to use trial and error don't actually need to solve them. None of the puzzles in Riddle of the Sphinx have anything to do with the environment or involve interesting pieces to be manipulated. Characters: There are none. The general trope is lifted straight out of Myst (first-person viewpoint, non-interactive NPCs you can only learn about through reading their extensive journals and letters), but unlike in Myst, there is no real mystery to be solved, no immediate compelling reason to figure out who any of the individuals are, and you're supposed to have known Gil for years, so the slow and boring quest to learn his backstory makes no sense at all. Gameworld: The Egyptian feel is nice, if poorly illustrated. The biggest problem here is how contrived and inconsistent it all is--ancient stone doors that open to passwords, a pit full of live crocodiles in the middle of a pyramid that has supposedly been sealed for centuries, random magical mechanisms devoid of any supernatural sense of wonder. It's as if you walked into the ruins of Troy and stumbled into a previously undiscovered crypt full of spellcasting centaurs and slider puzzles, and this somehow failed to surprise you. It's almost a letdown to think that the ancient Egyptian pyramids really weren't any more majestic or exotic than the kind of dungeon your middle-school dungeonmaster would have come up with. Gameplay: The gameplay of Riddle of the Sphinx can be repetitively boring. There is only one way to interact with any given object, and only one solution to any puzzle; the intermediate time is spent wearily trudging back and forth between puzzle stages, which are inconveniently located dozens of screens apart, and listening to mind-numbing cassette tapes full of realistic "like I was, uh, saying, this is really, um, interesting and I hope you, uh, think so too, so let me, uh, tell you the next clue now..." filler. (Note to game designers: this kind of thing is dull enough when it's written in skimmable journals, but is absolutely excruciating when you're forced to sit there LISTENING to the entire thing.) No creative thinking is required in this game. Interface: This may be the worst interface I've seen in fifteen years. Clicking on an interesting-looking object with the same forward-pointing arrow may move you closer to it, may move you further away from it, may activate it, or may do nothing at all; there is no way to tell this in advance. Meanwhile, there are a dozen or so different-looking cursors, most of which are unintuitive and/or redundant. Clicking to the left will sometimes turn you 90 degrees to face left, and other times turn you 180 degrees to face the direction you just came from. The inventory system is wretched and seems designed to turn no-brainers into "puzzles" (how to light a stove in one area, for example, when the interface won't allow you to put the matchbook from another area into your inventory?) To get down one path you have to click about twenty times in succession, with nothing of interest in any of the time-wasting areas in-between. I could go on and on. I would have thrown this game away part-way through if I hadn't been playing with my children. Ambience (Graphics, Sound, etc. ): The music is pretty good, and the crypts have a nice feel to them (though it's more of a "yo, neat dungeon" sort of ambience than a "feel the wonder of the Great Pyramid" sort, and I would have preferred the latter). The voiceover at the end is very poor quality and hard to understand. The graphics are pretty bad (choppy, blurry, cartoonish in places). I don't normally put too much emphasis on graphical beauty, but this is a SLIDESHOW PRESENTATION, so you really have to expect that the slides are going to look kind of nice to compensate for that. The original Myst, released seven years previous to this game, had better graphics than it does. Lora's Recommendations: Skip this game completely; there is absolutely nothing it does that its sequel, The Omega Stone, doesn't do better. Even that game isn't nearly as good as dozens of other exploratory graphic adventures out there. The Myst games are a good place to start: despite their flaws, any of them is head and shoulders better than Riddle of the Sphinx. If You Loved Riddle of the Sphinx: Then you will probably also like its sequel, Omega Stone. If you haven't yet, you should really play the classic Myst series of games that inspired this one (Myst, Riven, Exile, and Revelation). The puzzles in those four games are more interesting than the ones in Riddle of the Sphinx, the graphics and interface are far superior, and they are set in an absorbing gameworld to boot. Other puzzle-adventures you may enjoy include the Sherlock Holmes adventure Mystery of the Mummy or the outstanding fantasy epic The Longest Journey. For a more detailed critique of Riddle of the Sphinx involving spoilers, please see my Backseat Game Designer page. Happy gaming!